PPAF has supported Dominican strategic planning for aquaculture at the national level, with collaboration in 2007 and 2010 for major events, as well as consultations on a regular basis regarding strengthening of the institution and the membership of the Dominican Aquaculture Association (ADOA). According to the UN Food and Agriculture Organization (FAO), nearly half the fish consumed as food worldwide are raised on fish farms rather than caught in the wild. Aquaculture now provides 43% of the fish consumed by humans compared with just 9% in 1980. An FAO 2010 study shows aquaculture in Latin America and the Caribbean (LAC)has grown very rapidly, rising from about 11 thousand metric tons per year in 1976–1978 to 1.73 million metric tons per year in 2006-2008, valued at US$ 7.2 billion. Even with a limited aquaculture production in global terms, the LAC Region stands out in salmon/trout and tilapia production and exports. ​Anthony Simon, participated on January 6th in the first meeting of the Comité de Pilotage du Programme du Développement de la Pêche Artisinale (the Preparatory Committee for the Development of Artisinal Fishing). Mr. Simon represented the Groupe de Concertation pour la Pêche et l’Aquaculture (the Consultative Group for Fishing and Aquaculture.) Further steps are expected in the coming months. The Dominican Aquaculture Association (ADOA) and its partners held "Estrategias para el Desarrollo de la Agricultura Dominicana 2010-2015" as a review and planning workshop, in March 2010 in Santo Domingo. 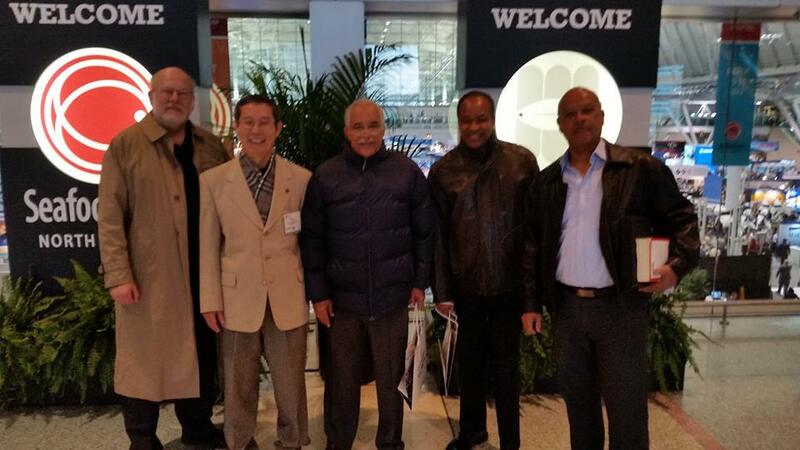 PPAF co-sponsored the event and arranged for participation by Dr. James Tidwell, who is Chair of the Aquaculture Program at Kentucky State University, and past president of the World Aquaculture Society. 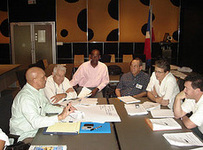 On September 28, 2007 at the Autonomous University of Santo Domingo (UASD), David Stillman (PPAF), Richard Thompson, (Business & academic consultant), Clara Benedicto (Vice Rector, Research & Graduate Studies) and Lourdes Rojas (Vice Dean, Faculty of Sciences) met with University Rector Roberto Reyna (center) to plan the international fish farming conference that would take place in December. took place in Santo Domingo from December 3 to 5, 2007. The Autonomous University of Santo Domingo (UASD), served as host. A team from UASD, the Dominican Aquaculture Association (ADOA), farmers, private investors, the Fisheries Council of the Dominican Government (CODOPESCA), the Dominican Institute for Agribusiness and Forestry Research (IDIAF) and others led the preparations in collaboration with PPAF. ​Over 70 attended, including business people, academicians, Dominican government officials, local farmers, representatives of non-governmental organizations, commercial interests, United Nations organizations, the European Union, US Department of Agriculture and others. See the newsletter of December, 2007 for further details.